Barbados? Then look no further !! 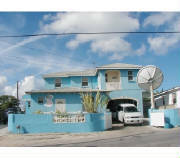 Sweetcane Apartments/Guest house is located in central Barbados in a residential area. Great for holiday seekers, business officials and persons coming to Barbados for US Visas. While we cannot guarantee you will get a visa, we will make your stay enjoyable. According to Rudolf a guest, "I slept like a baby last night”. You will have all the comforts like Air Conditioned Rooms, Full Fridge, Stove, Satellite TV etc. A mere ten minutes drive will bring you to Bridgetown, the main city of Barbados ( where if you can't find it we most likely don't have it), the United States Embassy or even the University of West Indies. Five minutes will take you to the National Stadium ( where you can exercise around the track or just take in a game from a multitude of sports available ) or a Food Court and Supermarket ( conveniently located for all your needs and supplies ). We also offer collections from the airport and drop offs at local attractions including the beach and St Lawrence Gap in our 7 seater van.